The common saying “life is a journey, not a destination” can also be applied to the world of sales. As you know, it can be a journey to move a consumer to a loyal customer. As a marketing funnel is designed, the top of the funnel is large and open, where one uses various strategies to bring awareness to a brand, product, or service. As the funnel narrows, you find potential customers in the middle of the funnel, where you must nurture their interest and guide them as they are still considering all their options. Although some fall out is normal, the goal is to transition the consumer into a buying customer in the bottom of funnel component. In bottom of the funnel marketing, you are not only seeking to close the deal, but to create a positive experience that will bring loyalty from the customer and instill in them the power to bring other consumers into your network. What are the Key Components of Funnel Marketing? The key components of funnel marketing are bringing awareness and creating interest in your product or services, connecting to consumers who are considering what you have to offer, then obtaining a commitment and ultimately getting their business. Bottom of funnel marketing may seem like it naturally plays out once you have convinced the consumer to make the purchase; however, it is imperative to not only complete the sale but also reinforce the value they see in your offer. As the middle of the funnel depends on building relationships and providing education, this must continue to lead your target audience to the final step. The final component of the process carries an underlying theme from the top to the bottom, which is providing quality service and listening to the customer’s true needs. As they become aware of what you have to offer, there must be a need or desire for that service or product to move down the funnel. As you guide them to the sale, remember to let them tell you what they really need and are seeking from your brand. The deal isn’t quite done when the ink is dry. Again, when you imagine a funnel, it starts large and tapers to a small tip. The larger the number of people that top of funnel strategies reach, the greater the chances to move them down the line. Be aware that to find success in the bottom of the funnel, you must evaluate your conversion rates from top to bottom. Preventing fall out is still a priority, and follow ups are a great strategy to move consumers into customers. If you have one person primarily working with a consumer, try adding a support team to reach out as well. Once the considering prospect has another positive interaction, this can put them at ease and encourage them to commit. Other strategies for bottom of funnel marketing is creating a sense of urgency, and even having a potential customer put a time frame on when they plan to make their decision. The balance is in finding the appropriate amount of pressure. In order to incentivize someone to decide, try to showcase the product or service. Depending on the industry, there are many tools to explore to make a sale and finalize a deal. This could include discounts, rebates, coupons, or a visual presentation. Of course, the main goal of any marketing or sales tactic is to entice and gain buying customers. However, it is important to keep in mind the long-term goal of happy customers who will help bring more consumers your way. If you fail to provide quality products or services, the customers you lead to the bottom of the funnel will end as one sale and could hurt future endeavors. To truly find success, always reflect on if you were able to deliver what you promised. To keep the momentum and create lifelong customers, don’t let go of the trust you established during the process. Even if it was a quick sale, establishing yourself or your company as their lifelong resource will pay high dividends. Providing insight and education on a product or service will set a powerful expectation. When making the deal is the end of the line, you fail to utilize the new customer as an outreach. Word of mouth can be more influential than any social media or marketing campaign you employ. Additionally, it is free and can bring in consumers who wouldn’t normally respond to an ad. 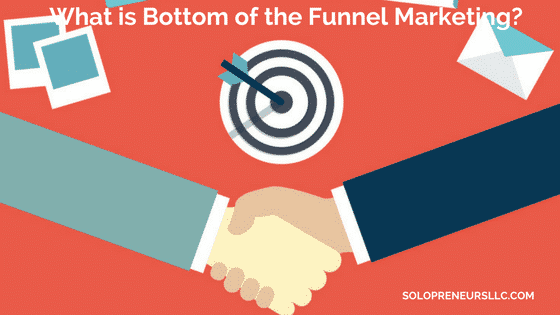 The bottom of funnel goal has led to the customer deciding to trust you. Again, ensuring you met their goals, needs, and expectations are the basis for creating a lifelong customer. Depending on the product or service you provide, a customer may not need to come back for an extended period of time. However, you may be fortunate enough to have a frequently repeating customer. Whatever the timeframe for their next purchase, you can use different follow ups and strategies to keep your brand on their mind. First, try to establish a “preferred customer” program. This could include some sort of incentive for returning, as well as rewards for referrals. In addition, positive feedback and reviews are ideal outcomes that can be worked back into your top of funnel marketing content. Ultimately, the bottom of funnel strategies must create a bond with the customer, so that they will think of your product or service when they have a need for your industry. Don’t just get the sale but continue to highlight not only what you can do for them in the present, but also add value in what you can offer in the future. Do you have success stories of your own regarding bottom of the funnel marketing? We’d love to read them! Share your tips and strategies with our readers in the comment section below.